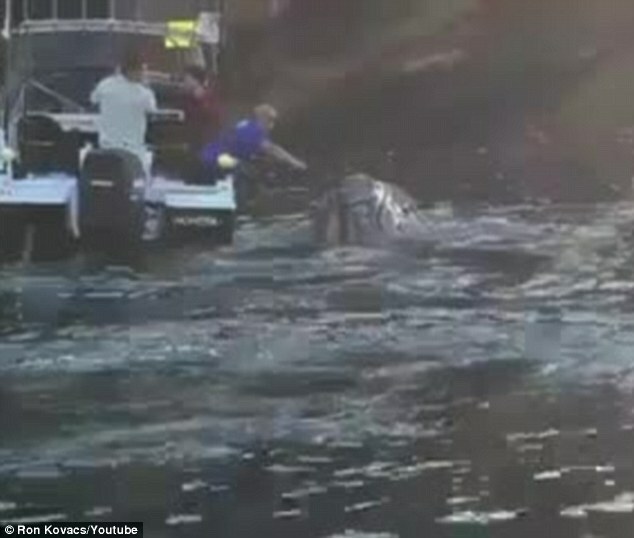 A whale has been filmed ‘asking’ for help extracting a plastic bag from her mouth. Not only that – but once the bag was removed – she even posed for selfies afterwards. The group of fisherman who helped the mammal first noticed her after she nudged their boat to catch their attention in Middle Harbour, north of Sydney. She then circled the boat and swam underneath it. The men then noticed she had rubbish bags and fishing line caught in her mouth and one of them – Ivan Iskenderian – quickly scabbled to pull both items out. 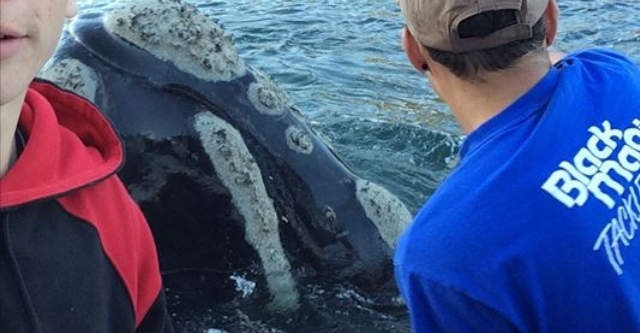 Ivan’s friend Michael Riggio, 17, snapped a few selfies with the whale while another fisherman Ron Kovacs filmed part of the encounter from another boat. 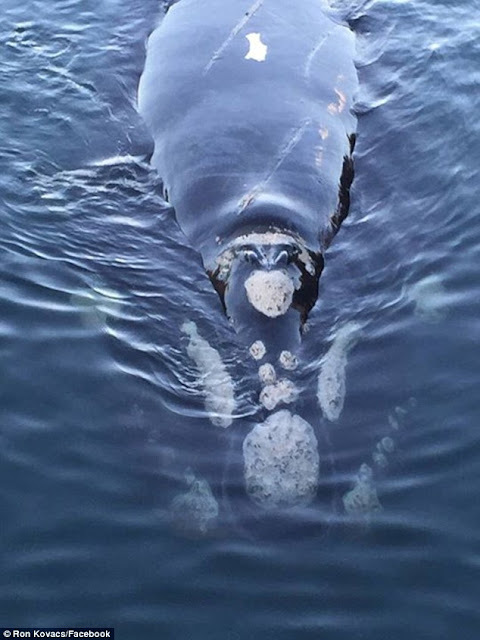 Afterwards the whale was seen by the fisherman flapping her fin and swimming away – apparently a showing her appreciation. Ivan described the moment as ‘unbelievable’, telling Manly Daily: ‘It was surreal. We couldn’t believe our eyes.’ The other fisherman Rob added: ‘He just popped his head up so you could reach out and remove the garbage. He tried on my boat but we are a bit higher. Responses to "Whale ‘asks’ for help removing plastic bag from her mouth"
Wonderful to see humans helping an animal for a change, beautiful! when are we going to ban plastic bags? screwing sea life all around.. Totally AWESOME!! Wish the world had a lot more people like these guys! Thanks y'all for stepping up and doing the right thing ! We have to get rid of all this plastic waste from the oceans. The beached dead whales in the UK had stomachs full of plastic. Don't use it if you can't guarantee that it will be recycled and not just dumped. Well done to all concerned in this great footage. Sarah: 90% of the garbage in the oceans come from those wonderful cruise ships. Yep, the ones you just have to lay back and enjoy for 10 days. Out of sight, out of mind. Or the passengers just don't give a damn. Not sure which it is. Those ships pollute like crazy and not a thing is being done. Apparently they are in "No Man" waters so can't be told what to do. I say we should have "World Waters Assoc." and level fines so big they will really think hard and fast about their dumping. Just a thought. The more we interact with wildlife, the more we seem to learn. Maybe that's why the world is set up so we can't interact anymore. I agree with previous posting. No man's water belongs to every man on earth. Only one problem with fining the hell out of those cruise ships. If they have to pay to dump their pollution, they will pass that onto their customers and apparently they won't pay more for the ticket. All about money, as usual. Our dirty oceans are a result of several things. Cruse ships are only one. Am I the only one who remembers seeing photos of garbage barges taking full boats of garbage out into the ocean to dump it in cities like New York? Or how about all these people who spend the day at the ocean and leave their trash laying about. Tide comes in, trash goes out. Sail boats, fishermen, vacationers. There is an island of trash in a couple parts of our oceans. There should be away to clean this up but so far I haven't heard of anyone trying. How can we keep a very important resource (bounties from the ocean) healthy when we spoil it with our disposable left overs. This subject needs to be hammered home to all social media all the time by all available sources. Start with all cruise, all military sailing vessels, commercial shipping vessels, private and corporate yachts. Add a tax to fuel for all ocean going vessels.